Is Beer from a Pouch the Man-Child's Heaven? Sometimes the ingenious aspect to a product is not the product itself, but what carries the product from production plant to consumer. Capri-Sun, while tasty, is a singular voice of sugary, juice concentrate drink fighting to be heard amongst an overcrowded pantheon of sugar-saturated drinks aimed at children. While its varied flavors don’t set it apart from its high fructose glutted brethren, its unique packaging makes it stand alone. Storing a beverage in a pouch is just superior. They take up less space, whether full or empty, they can travel anywhere, they block light, and while Capri-Sun doesn’t implement this feature they can have an extremely low-carbon footprint and be designed to be reusable. The pouch is just a fantastic way to go. Beerpouch.com will continue to revolutionize the packaging of carbonated beverages, offering green solutions to the problems faced with traditional packaging. We will protect fine beverages for the enjoyment of those who appreciate freshness. We will nurture a growing network and strive to garner continued value and market share on behalf of our stakeholders. Personally I am excited about the prospect of the “Beer Pouch”. The company is named after their 64oz flexible growler beer pouch. For sale at reasonable pricing direct from their website you can own your own flexible growler with a resealable screw top closure. This pouch fits easily in coolers, can go where traditional growlers cannot, boasts complete light blockage and flavor neutral material. Most importantly though, when empty the thing folds flat to be stored anywhere. 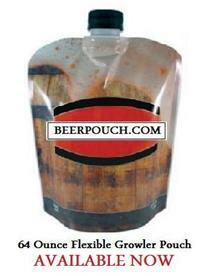 Not to mention it is a cheaper alternative to traditional growlers costing $60.00USD for a pack of ten. For taking beer to a glass harsh environment or for the eternally clumsy this is a fine alternative to the traditional beer growler. Since it is cheaper and takes up less space, this is ideal for the summer trip to the beach, park, or just a worrisome backyard BBQ where glass can be a hindrance to safety. But most of all it just looks cool and encourages the best part of summer nostalgia. Nothing compared to grabbing a pouch of Capri-Sun between water balloon battles on a hot summer day. Now the thirty year old adolescent can recapture that magic with a malted beverage alternative.